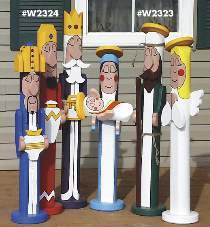 Make Mary holding Baby Jesus, Joseph and an angel, plus the Three Kings from low cost landscape ties and scraps of 3/4" stock. Nativity Post People measure 33" to 37" tall. Three Kings Post People measure 34" to 40" tall. Each pattern contains drawings for all figures in each group. All patterns are drawn FULL SIZE. Order each plan separately or SAVE with the Special Offer which includes both plans.